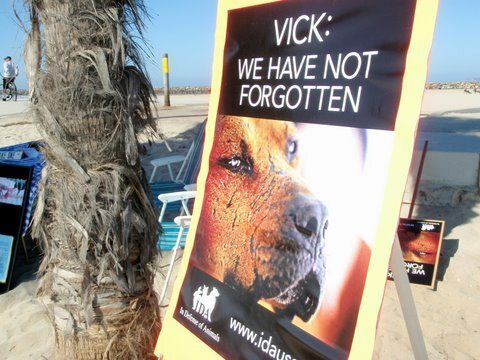 Philadelphia Eagles third string quarterback Michael Vick has drawn protests from animal rights groups around the country this fall, and San Diego was no exception. Members of the San Rafael-based In Defense of Animals staged a small demonstration at Dog Beach on Sunday and police radio reports from Qualcomm Stadium indicated that protesters were picketing entrances to the Chargers-Eagles match up on Sunday. The Dog Beach protesters were urging the National Football League to include dogfighting and cockfighting in the “criminal offense” section of its Personal Conduct Policy. Vick was convicted on charges stemming from his involvement in a Virginia based dogfighting organization, dropped from the roster for the Atlanta Falcons and served 20 months in prison. A recent Court of Appeals decision will allow Vick to retain some of the earnings that were thought to have been forfeited in that case. IDA has always been a strong supporter of civil liberties, and from that perspective, a Constitutional perspective, we need to accept that once any criminal has done his/her time, they need to be allowed the opportunity to return to society and contract for their labor. To deny any criminal that right would be a danger to all of our rights. No matter how despicable Michael Vick’s crimes were, and they were indeed despicable, he does retain the right to get a job once released from prison. It is also the right of any potential employer to choose whether or not Vick is appropriate for the job for which he’s applying. An NFL quarterback is, rightly or wrongly, a representative of a city, and a role model for youth. The Philadelphia Eagles have made the decision that Vick can be an honorable of Philadelphia, as well as a positive role model for young people. We disagree with that judgment. The crowd at Dog Beach on Sunday was sparse, with demonstrators being out numbered by media people at times. One cameraman, hoping to gain an action shot, jokingly offered $20 to a passerby if she could get her dog to urinate on a “Vick piss stick” being sold by IDA at the event. I doubt that any of these reporters found the time to accurately report IDA’s position. Oh, yeah. The Chargers held off a fourth quarter comeback by the Eagles to win, 31-23. Vick was not a factor in the game. i saw one tv report that was ONLY about the “pee pole”. i guess bodily functions trump cruelty to animals. U-T columnist Michael Stetz visited our local SD Humane Society for some straight talk about pit bulls and to offer a few words about Michael Vick. While I love all breeds of dogs, “Pitties” (Pit-Bulls) have a special place in my heart because they are so love-able and will do just about anything they can to please their person or people. I can only hope that Vick will take the lessons that he’s hopefully learned and help turn the breed back into the American tradition that many grew up loving, instead of the monsters that a lot of mainstream media loves to play up. the time did not fit the crime; but how often does it when heinous acts are committed? I think one needs to take into account Vick’s fall from grace as part of his punishment. To a hundred-millionaire, losing that money is tantamount to a long prison sentence. Think Warren Buffet or other mega-investors. Imagine how many crimes they’ve gotten away with? The most fitting punishment would be to turn them into paupers. It may be lenient of the NFL to allow Vick back into the league, but one also has to consider the social implications: here is a young black male, who has trained and breathed and lived and eaten football his whole life. Its clear he was never offered an education in morality or healthy choices – the guy was simply allowed to do whatever so long as he threw a tight spiral. Now hes been thrown in jail and had his money taken away. it seems that at least on the surface, he understands the implications of what he has done. I’m not so sure any punishment could be leveled against him that would be fair to all critics, so I say the best thing to do is to leave him alone and stop paying attention to him. Lets not forget that he has clearly lost a step or two, and finds himself way down on the depth chart – a nobody. I’m not so sure these protest are even worth the attention it gives him. what im trying to say is you cant deny a man the right to work, and do the only thing he knows how to do. Its not his fault that football players are overpaid. As an aside, the 40th anniversary San Diego Chargers went a woeful 1 & 15 in 2000 and therefore qualified for the 1st pick in the following NFL draft. With Bobby Beathard retiring, the architect of Buffalo’s Super Bowl teams of the 1990s, John Butler, was brought in as our new GM. Rather than take Michael Vick with our 1st pick in the 1st round, he traded it to Atlanta for their 1st & 3rd round picks. While Atlanta did take Vick with that 1st pick, we took LaDainian Tomlinson at #5 plus we also got their 3rd round pick where we took Florida State corner Tay Cody, plus they also gave us a burner returner named Tim Dwight too. We got a way better deal that Atlanta plus, with our 2nd round pick we took pro bowl QB Drew Brees, so I give great kudos to the late John Butler for seeing past the hoopla of the time, perhaps even seeing something in Vick that others may have missed or overlooked and finally setting the groundwork for getting the Bolts back on track. Point is, Vick could have become a Charger….